Share any relevant background information including leadership experience both within the church and in other areas of your life. Recently served as 1st Alternate Delegate. UMC active member since 1986, roles have been numerous from serving locally within the church gaining insight & experience to being able to serve at the conference level on the Missouri Mission Council. Leadership skills used are good Communicator, Good Listener, Dependable, Positive Attitude, Self Starter, & Motivator has afforded me the opportunity to serve as National President of UMW 2012-2016, General Board of Global Ministries 2011- 2016, General Commission of the Status and Role of Women 2008-2012 serving as the Chair of the Global Team. Proudly representing Missouri Conference on the World Methodist Council Co-Chair Nominations & Evangelism Committee Secretary 2016-2021. Advocacy Chair for BMCR. 28 years Employed w/State Farm Ins. handling Catastrophe Service Claims Countrywide, serving policyholders & agents to recover from the devastation. Active Member of 31 years with AKA Sorority providing Community Service year around. Describe your personal practices of intentional faith development that strengthen your spiritual engagement with God and your capacity for fruitful leadership in the church. Daily devotional either through reading a daily devotional, using the prayer calendar or using the scripture in the bible. I consider my quiet time with God a very important & private time to speak one on one. Sharing my joy, concerns, guidance request and sorrows. It allows me to also Thank God for the many blessings given to me. As a person who loves to hear the word of the lord through song, I will listen to music that reminds me of how wonderful & awesome God is in good times & bad times. I will graduate in May 2019 with my Masters in Christian Ministry, I have found my studies on laity involvement for increasing believers in knowing God for themselves. My hopes and goals are finding ways for all of God children to have a voice and a place at the table. Letting all know that God goodness can be received through the unconditional love provided. I have been blessed to provide one on one prayer with people everywhere requested. Sharing the word of God is a gift & a blessing! Why do you seek election as a lay delegate representing the Missouri Conference? 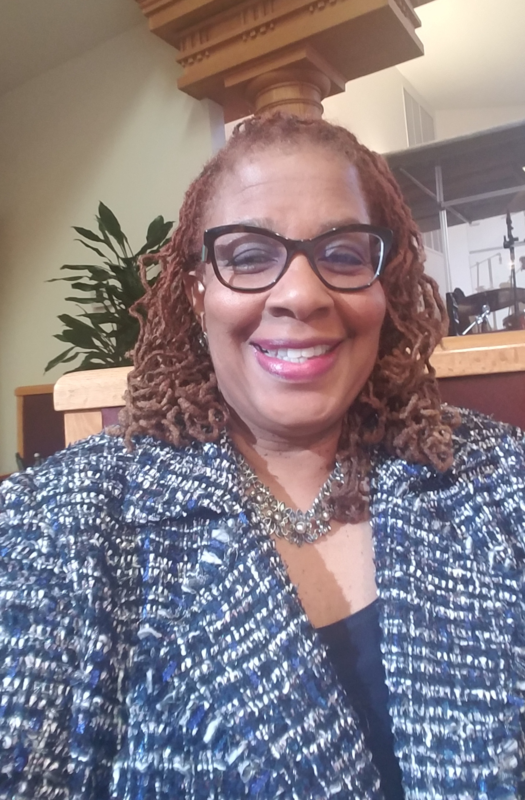 I am seeking to be a General Conference Delegate to provide a balanced perspective bringing an inclusive and diverse background, not only with race and gender but with a sense of concerns for those not at the table. I would like to opportunity to serve to bring my years of experience of conversation with individuals from all corners of Missouri. I would like to engage in conversation with other Missouri laity to work together and collaborate in making our church a place where individuals and family want to be apart of for their spiritual journey in life. This would allow me to engage with different perspectives and gain new understanding from individuals with different viewpoints but still have a love of Jesus Christ as our Lord and Savior. I believe this is any way to serve my church and my Conference using the gifts and talent given to me by God. I would be honored and humbled to represent the Missouri Conference as a Delegate to the General and Jurisdictional Conference. How will your involvement in General Conference 2020 support the church to fulfill the mission “to make disciples of Jesus Christ for the transformation of the world”? My Beliefs in the foundation set by John Wesley Quote: Catch on fire with enthusiasm and people will come for miles to watch you burn. I want to use my passion and dedication to serving God to help people come for miles. My energy and excitement for the Word of God will be used to listen to all voice or all ages, to speak on behalf of those without a voice and to share my journey in following Christ. I am willing to walk beside those with questions and concerns about their journey. I will read all the materials and seek additional resources necessary to be the best delegate to make a difference to the Church. Being able to use my confidence in who God has made me speak up and speak out in a committee meeting or on the general floor of the conference. I will always keep the main focus of being a member of the church is “to make disciples of Jesus Christ for the transformation of the world”? Since the primary focus for Jurisdictional Conference is to elect new bishops, what qualifications do you think the church needs in its future episcopal leaders? We need to seek Bishops who have a strong work ethic and good listening skills. They must have the ability to be inclusive that includes but not limited to age, race, and gender including younger members appointed and newly retired members with skills and ability. A Bishop who has demonstrated a balance to engagement of all the members for every part of their conference. Have a Bold Faith in God, Social Justice Awareness and ability to not just vote with the majority. Stand strong against hate, violence against women and Children and Support and uplift Men's Ministry. It would be helpful to support laity leadership training in the local churches beyond just the lay leaders. Our church members also serve in leadership on the jobs, in community organizations,& in their homes. Finding ways through appointment for our youth to be more engaged in not using their tenure but a way to gain experience which would give them a firsthand insight into God goodness keeping them engaged.